The TENS is a low-voltage electrical impulse generator used as a non-pharmacological pain control device. It usually looks like a portable transistor radio and can be attached to one belt. Properly turned, patients are able to use this device as they go about their daily activities. This special unit for Notalgia has two electrodes with removable gel based safety pads. Most Notalgia Paresthetica patients find the ideal placement is as the back of the neck at the base where it joins the upper back. Most people carry most of their tension in their neck and upper shoulders. TENS is most effective in reducing the itching in notalgia (mostly the middle of the back) by having treatment on the neck around levels C4-C7. However, an element of trial and error is always present when determining individual placement. After the electrodes placed with conducting jelly between them and the patient’s skin, the controls are set, the unit is turned on, and a pulsating current passes through the area providing a mild-to-moderate stimulation. Some practitioners prefer low frequency/high intensity stimulation while others favor high frequency/low intensity application. The literature and clinicians both report variations in treatment time, ranging from 15 or 20 minutes daily to use throughout the day. They also stress the importance of evaluating your progress and check-in in with your doctor regularly. Exactly how relief is achieved is not fully known, but there are two prevalent theories: one, the Gate’ Control Theory, suggests that the pulsating current overloads the nerve circuit and blocks pain signals to the brain; another theory says that electrical stimulation causes the brain to react by releasing natural pain-suppressing substances called enkephelins and endorphins. A literature review indicates that TENS does not cure a disease and does not work in all cases, but may give symptomatic relief of pain. Most clinicians agree that TENS applied properly can be effective. Although some clinicians report as much as a 90 percent success rate with TENS in carefully selected patients, most report about a 40-50 percent success rate. As with any medical condition, no two individuals are alike and therefore responses vary. TENS may not work equally as well for everyone with Notalgia. Do not turn TENS up too high as this can cause over-stimulation which may make pain worse. There should be no muscle contraction. TENS should also be used with caution in people with epilepsy or pregnant women (do not use over area of the uterus as the effects of electrical stimulation over the developing fetus are not known). TENS should not be used by people with an artificial cardiac pacemaker due to risk of interference and failure of their implanted device. Possible failure of these warnings can result in a cardiac arrhythmia. In the situation where low frequency (or acupuncture-like) TENS is being used, it is necessary to increase the intensity of the stimulation to the point where a demonstrable muscle twitch is evident. This 2-6Hz (pulses per second) output increases the systemic release of endorphins which in turn cause pain relief. An 2009 article by Wang et al at Stanford University showed evidence of effective treatment of Notalgia Paresthetica in 4 patients using EMS technology. The Case Report entitled “Serratus muscle stimulation effectively treats notalgia paresthetica caused by long thoracic nerve dysfunction: a case series” depicts placement of two electrodes from the electrical unit placed on the serratus muscle just below the underarm area. The electrodes are placed about an inch apart on the skin. Full article Abstract Currently, notalgia paresthetica (NP) is a poorly-understood condition diagnosed on the basis of pruritus, pain, or both, in the area medial to the scapula and lateral to the thoracic spine. It has been proposed that NP is caused by degenerative changes to the T2-T6 vertebrae, genetic disposition, or nerve entrapment of the posterior rami of spinal nerves arising at T2-T6. Despite considerable research, the etiology of NP remains unclear, and a multitude of different treatment modalities have correspondingly met with varying degrees of success. Here we demonstrate that NP can be caused by long thoracic nerve injury leading to serratus anterior dysfunction, and that electrical muscle stimulation (EMS) of the serratus anterior can successfully and conservatively treat NP. In four cases of NP with known injury to the long thoracic nerve we performed transcutaneous EMS to the serratus anterior in an area far lateral to the site of pain and pruritus, resulting in significant and rapid pain relief. These findings are the first to identify long thoracic nerve injury as a cause for notalgia paresthetica and electrical muscle stimulation of the serratus anterior as a possible treatment, and we discuss the implications of these findings on better diagnosing and treating notalgia paresthetica. Abstract Notalgia paresthetica (NP) is a common, refractory sensory neuropathic syndrome with the hallmark symptom of localized pruritus of the unilateral infrascapula. It is generally a chronic, non-curable condition with periodic remissions and exacerbations. While the dermatologic syndrome may be multi-factorial in etiology, its possible association with underlying cervical spine disease needs to be evaluated for proper treatment. Radiographic studies of the spine may be more considered than they are currently. Collaborative multi-specialty evaluation by dermatology, radiology, neurology, and orthopedics may be indicated in primary management of this condition. First line therapy for notalgia paresthetica with associated cervical disease may include non-dermatologic spinal treatments such as spinal manipulation, physical therapy, massage, cervical traction, cervical muscle strengthening, and oral non-steroidal anti-inflammatory medications and muscle relaxants. Notalgia paresthetica may in fact be a dermatologic sign of an underlying systemic disease. 37 year old patient presented with 3 years of intermittent bouts of recurrent itching on the right infrascapular skin of the back in T5-T6 dermatome. Failed past Notalgia Paresthetica skin treatments had included topical clobetasol cream, fluocinonide cream, oral hydroxyzine, oral diphenhydramine, chlortrimeton, intralesional triamcinolone 2.5mg/cc, and Tiger balm. MRI of the cervical and thoracic spine revealed C5- C6, and C6-C7 disc protrusions and multiple osteophytes at these levels. Notalgia paresthetica (NP) is a sensory neuropathic syndrome of the back, classically of the unilateral infrascapula. It is primarily associated with intense localized pruritus. NP was first named in 1934 and described as episodic itching or pain on a small patch of the mid back, usually an area of skin just past easy reach. Additional features of the dermatologic condition may include localized burning, pain, tenderness, hyperalgesia, or dysesthesias. Notalgia paresthetica may be associated with a poorly circumscribed tan or hyperpigmented patch in the symptomatic area. Notalgia paresthetica tends to be a chronic condition with periodic remissions and exacerbations. While not life threatening and not generally associated with other co-morbidities, it does frequently decrease quality of life causing much discomfort and nuisance to the affected patients. Treatment with topical modalities have generally failed and are difficult because of the difficult to reach location. To date, there has been no clearly described etiology and no uniformly effective treatment for notalgia paresthetica. Although the etiology of notalgia paresthetica is unclear, two of the multiple proposed possible mechanisms include 1) localized increased sensory innervation of the affected skin areas and 2) neuropathy from degenerative cervico-thoracic disc disease or direct nerve impingement.A study by Savk et al in 2000 studying 10 patients with NP demonstrated normal neurological examination and standard electrodiagnostic results in all study patients. All had skin histopathology compatible with post inflammatory hyperpigmentation. There were no amyloid deposits or other described pathology on pathologic exam of the skin. Seven of the 10 cases confirmed radiographic changes in the vertebrae corresponding to the dermatome of the cutaneous lesion. 9An earlier study by Springer et al in 1990 evaluating the mechanism of notalgia paresthetica studied whether the cutaneous symptoms were caused by alternations on the cutaneous innervation of the involved infrascapular area. They postulated that the histology findings with increased dermal innervation to the areas however no measurable change in the distribution of neuropeptide-immunoreactive axons was found. There was an increase in the number of intradermal PGP 9.5-immunoreactive nerve fibers and epidermal dendritic cells compared with unaffected areas from the same patients and normal controls. It was concluded that the symptoms of NP may in part be related to an increase in the sensory epidermal innervation in the affected skin areas. 3Histologic studies have shown cutaneous changes in a few cases including lichen amyloid which may be secondary to the localized chronic scratching and rubbing. 12Clinical observations in orthopedics has established a clear relationship between the upper thoracic/interscapular region and the lower cervical spine. Frequently, cervical disc disease presents as referred pain in the upper thoracic and interscapular area. Similarly, some tumors of the cervical medulla have also presented as interscapular pain. 2Some have speculated direct involvement and actual entrapment of the posterior rami of T2 to T6 spinal nerves. However, there is referred symptoms from the cervical area directly to the infrascapular back. Degenerative vertebral and disc changes corresponding to the affected dermatome may be observed in some cases. Recent literature supports a role for radiographic imagine of cervical and thoracic spine to exclude disc disease and possible nerve compromise. With recent advances in radiography and availability of magnetic resonance imaging (MRI), earlier detection and intervention of cervical disc disease may be possible. Early recognition may promote timely intervention and treatment to prevent cervical spine disease progression. In addition to degenerative cervical discs, osteoarthritis, and cervical spine strain and muscle spasm, there may be a neoplasm or other pathology of the cervical spine contributing to notalgia paresthetica. There is some thought that there may be a relation between notalgia paresthetica and brachioradial pruritus. The recently described association of many cases of brachioradial pruritus (BRP) and cervical spine disease and description of the disease as a possible neuropathic/ neurogenic condition also support a probable neuropathic association of nostalgia paresthetica. 5 In contrast, notalgia paresthetica is unilateral while BRP may be involving unilateral or bilateral upper extremities. Topical therapies aimed at the back may be in fact be ineffectual or partially effective as basic emollients. Since the disease does have periodic spontaneous remissions and exacerbations, it may be difficult to accurately measure response to various therapies. A placebo response may be considered with some therapies.The differential diagnosis in notalgia paresthetica may include allergic or irritant contact dermatitis, fixed drug eruption, dermatophytosis, neoplasm, lichen amyloid, arthropod reaction, lichen simplex chronicus, neurodermatitis, infection, other hypersensitivity reaction.During the initial assessment of patients with notalgia paresthetica, it is important to obtain a thorough past history of osteoarthritis, prior neck trauma, motor vehicle accident, vertebral fracture, cervical neoplasm or malignancy, or cervical disc disease. In the absence of positive medical history, radiographs or MRI of the cervical spine may aid in diagnosis and treatment. Further, a positive family history of osteoarthritis or vertebral disc disease may be contributory.When pruritus is generalized and persistent, a full laboratory workup including complete blood count, chemistry panel including renal and liver functions, chest x-ray, and other studies may be warranted to exclude other causes.Proper management of notalgia paresthetica may involve a multi-specialty cooperative effort of dermatology with radiology, orthopedic surgery, neurology, and adjunctive fields including acupuncture, chiropractic, and physical therapy.While to date there has been no uniformly effective treatment, current therapeutic options for notalgia paresthetica include capsaicin cream, eutectic mixture of local anesthetic (EMLA) cream, topical steroids, pramoxine cream, topical cooling, oral steroids, Tiger balm, menthol creams, Cordran tape, intralesional corticosteroid injections, botulinum toxin injections, 11 oral antihistamines, hydroxyzine, doxepin, topamax, anticonvulsant medications, carbamazepine (Tegretol) antidepressant medications, gabapentin (Neurontin), oxcarbazepine, 14 topiramate, thalidomide ,10 paravertebral local anesthetic block, 15 cervical epidural injection, surgical resection of the rib, and many others. 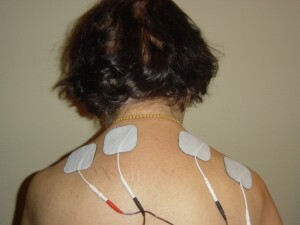 Some of the current systemic therapies may in fact exert their effect through the spinal nerves and central nervous system thereby supporting the neuropathic etiology of NP.In the future, first line therapy for notalgia paresthetica with associated cervical disease may include non-dermatologic,TENS or transcutaneous electrical nerve stimulation,non-invasive treatments such as spinal manipulation, physical therapy, cervical soft collars, massage, cervical traction, cervical muscle strengthening and increased range on motion, cervical discectomy with fusion, oral non-steroidal anti-inflammatory medications (ibuprofen, celecoxib, ketoralac) and oral muscle relaxants (carisoprodal, cyclobenzapril, methocarbamol, metaxalone). Other measures for degenerative disc disease as introduced may also be considered. Conclusions Notalgia paresthetica may not be solely a skin disease per se but a cutaneous sign of an underlying degenerative cervical spine disease. The striking association of notalgia paresthetica with degenerative or traumatic cervico-thoracic spine disease suggests that early spinal nerve impingement may contribute to the pathogenesis of this skin symptoms of the disease. 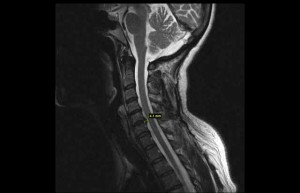 Additional studies are needed to further assess the relationship of notalgia paresthetica with cervical spine disease. Whether this is a causal or coincidental finding remains to be determined in larger studies. While topical therapies may in some cases seemingly help decrease the localized symptoms in notalgia paresthetica, systemic or broader scope spinal evaluation may be warranted to fully evaluate refractory cases. Cervical spinal imaging and treatment may be appropriate as primary or first line therapy in many cases of notalgia paresthetica.